A two stories residence that is located in the urban district. 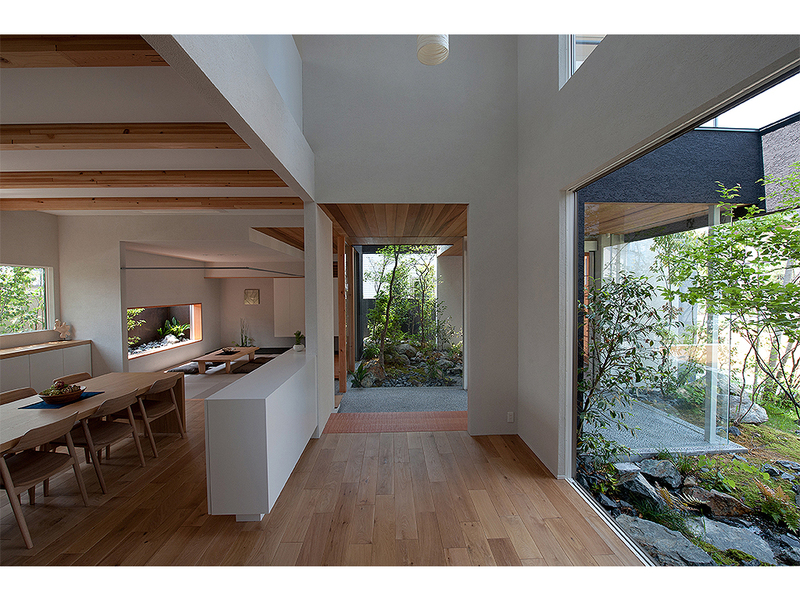 As a demand for client side, it was ‘we would like to live in “the forest”. 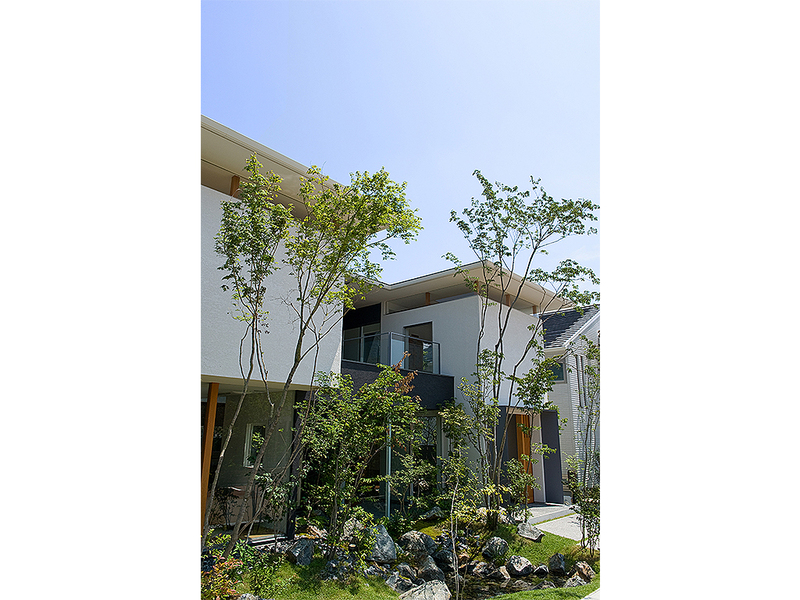 We would like to lose the boundary between garden and architecture. In the place of relaxation where the person gets together.’ Accordingly, we used trees, water, light and sound to make a space where you feel like outside when you are inside. 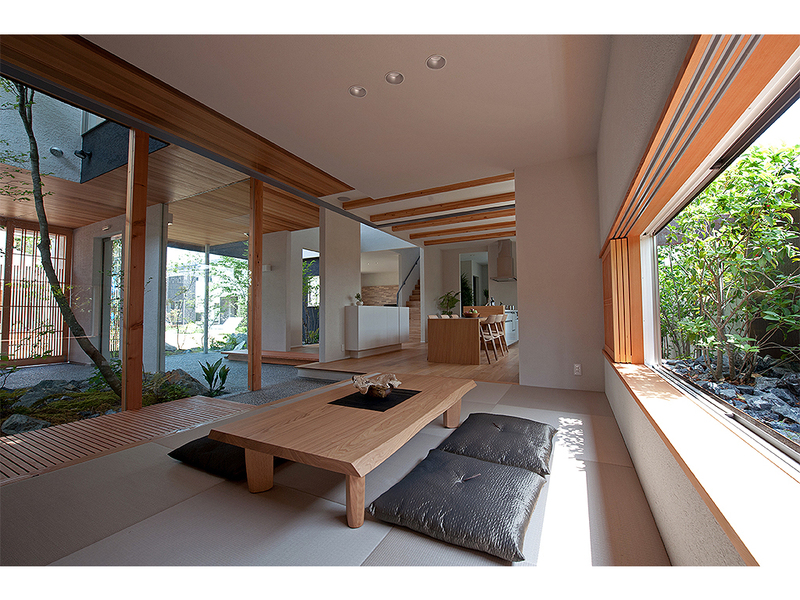 The building is matched traditional Japanese house which have large earth floor when you get into the entrance and dining room, living room and guest room are follows behind it. Building surroundings with a big window is covered by green to be a space where light comes through the green. There is a courtyard in the back of entrance (space of enjoying the cool) and this is the headstream of flow. To reproduce a feeling of being in a deep forest, moss and fallen leaves cover the footing. 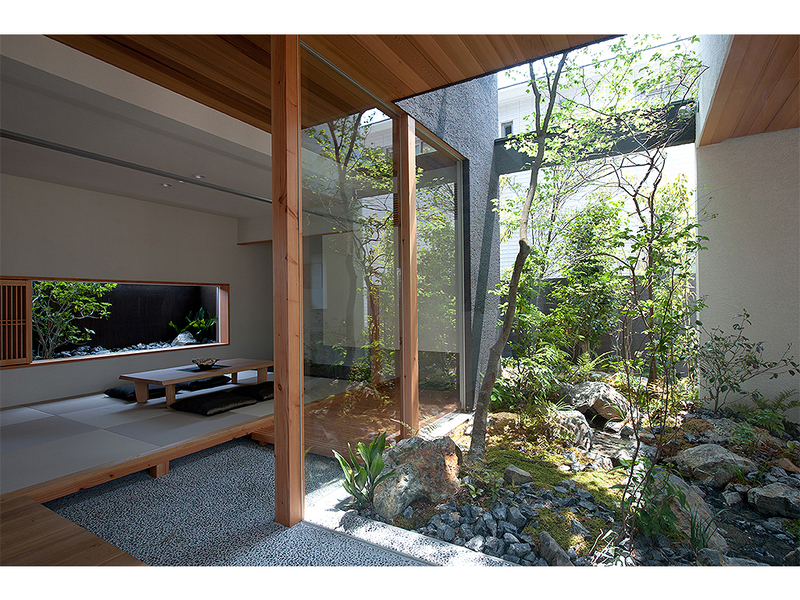 A method that puts the guest room with the garden is applied to create the guest room through courtyard from the entrance and arrange another courtyard behind the back window of the guest room. 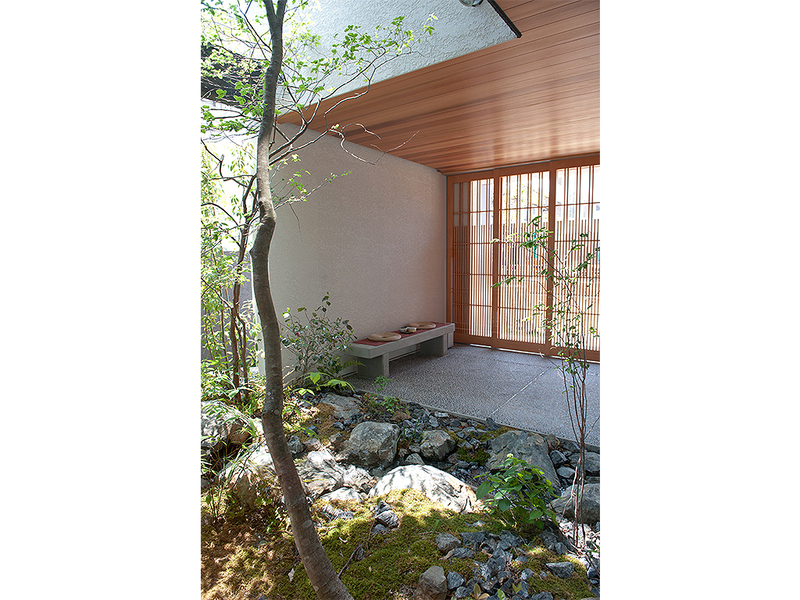 When you pass the entrance and getting into the passage earthen floor, water run from center courtyard passes under the footing and a view spreads into second courtyard. It is the midstream of flow. When you take off your shoes and pass through “space of gathering” which connects living room and dinning room, you get a view of pond at the left hand side that is very close to the midstream of the flow. The kitchen that is surrounded in rich green make you fall into a feeling like cooking and having dinner in a flow of forest. Furthermore, when you pass the living room at the back, a ground with a carpet of lawn appears from the big window. Ground level that is 100 mm down from the ground floor level is like a stage appeared in lawn. 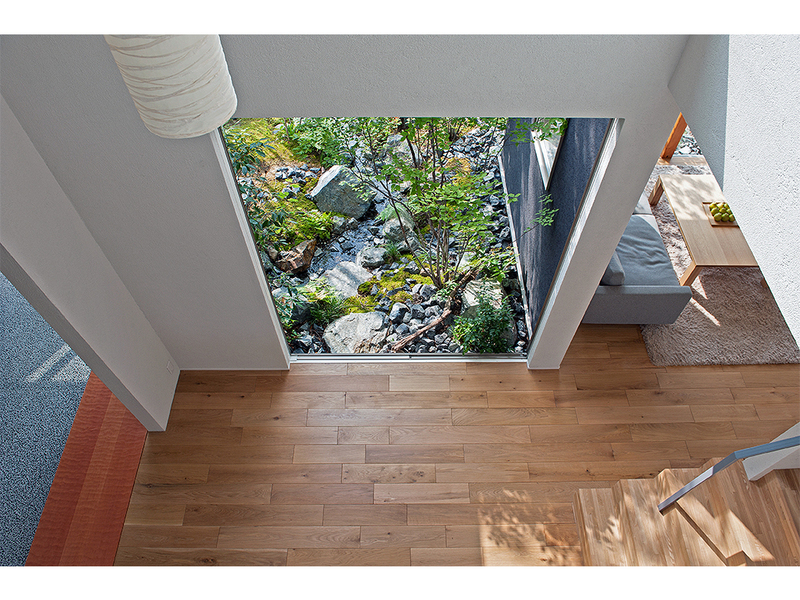 The heights of trees are also considered to be able to feel it from bedroom in the first floor. 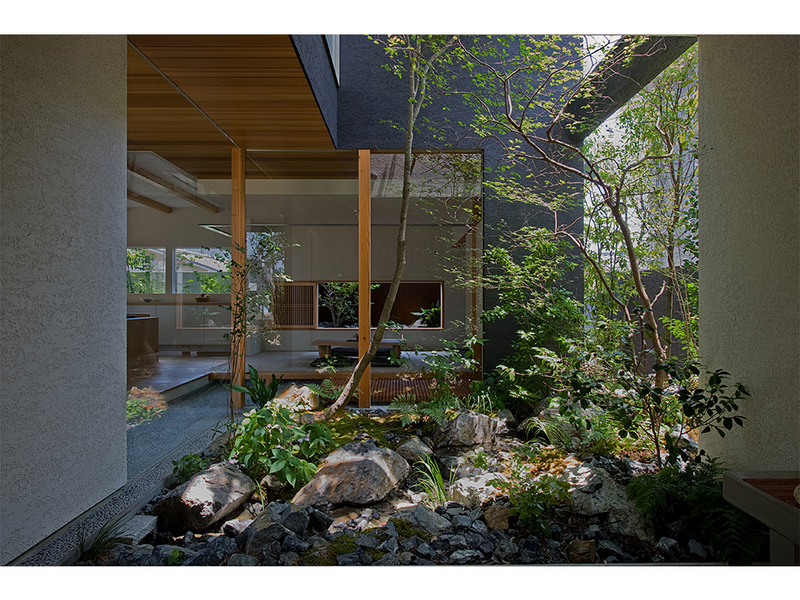 In addition, the greens are layered by method that is putting internal space in between gardens to have views of living floor through garden or garden through living room and also it is calculated　to get a view of the inequalities of the ground from inside by setting the ground level close to the floor level at all over ground floor level to make the greens closer to architectural internal space. 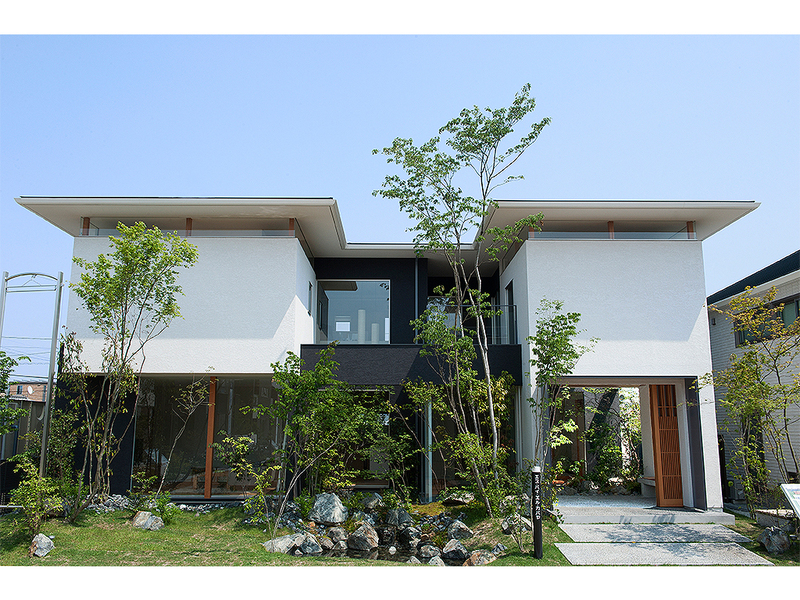 It is a mechanism that to provide a pond at the center of external facade and water under foundation of the house flows from the back of the center courtyard to the pond. The flow runs 24 hours by a circulation system. The Pebbles, the gravels and the sand laid onto the bottom are contrived to clean the running water. The plantation is used only very well acquainted local indigenous breed to make closer to the familiar forest.